Recent concerns over the possible hazards of electrical and magnetic fields in the home and workplace are comprehensively addressed within this book. 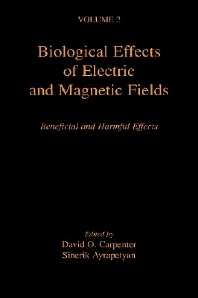 The chapters contain detailed research on the biological effects of electric and magnetic fields, and evidence for and against any interaction of electromagnetic fields (EMFs) and the biological systems. Effect of Electrical Fields on Neuronal Growth and Regeneration, W. Young. Therapeutic Uses of Electric and Magnetic Fields in Orthopedics, A. Bassett. Electric Field-Induced Calcium Flux and Changes in Cell Shape, Motility, and Cytoskeleton, S.W. Hui. In Vitro Systems for the Study of Electromagnetic Effects on Bone and Connective Tissue, R.A. Luben. Electric and Magnetic Field Effects on the Immune System, A. Chiabrera, R. Cadossi, F. Bersani, C. Franceschi, and B. Bianco. Autoimmune Reactions as a Possible Component of Stress Induced by Electromagnetic Fields, A.M. Serduke, Y.D. Dumanskyj, and S. Mandzu. Effects of Electric and Magnetic Fields on Transcription, R. Goodman and A. Shirley-Henderson. Electric and Magnetic Fields and Cancer: The Use of Field Exposure Measurements in Epidemiological Studies, S. Koifman and G. Th_riault. Epidemiologic Evidence on Cancer in Relation to Residential and Occupational Exposures, D.A. Savitz and A. Ahlbom. Electric Power and Risk of Hormone-Related Cancers, R.G. Stevens. Thermal, Cumulative, and Life Span Effects and Cancer in Mammals Exposed to Radiofrequency Radiation, J.A. Elder. Power-Frequency Electric and Magnetic Fields: Issues of Risk Management and Risk Communication, M.G.Morgan. The Public Health Implications of Magnetic Field Effects on Biological Systems, D.O. Carpenter. References. Index. School of Public Health, University of Albany, New York, U.S.A.